On the 20th April 2018, residents, families and staff alike, enjoyed an Afternoon Tea Celebration for National Care Home Open Day 2018. The Afternoon Tea itself, had a ‘Queen’s Birthday’ theme, with Red, White & Blue decorations together with a selection of Cream teas, Scones with jam and cream and tea and coffee. 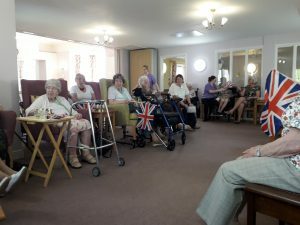 Entertainment was provided by Pip from ‘Sing for your life’, who led the singing with favourites from last night of the proms inspired music as well as other well known numbers.